Below you can view all the condos for sale in the Cheesman Park subdivision located in Denver Colorado. Listings in Cheesman Park are updated daily from data we receive from the Denver multiple listing service. To learn more about any of these condos or to receive custom notifications when a new property is listed for sale in Cheesman Park, give us a call at 720-729-2320. Lush back yard with detached garage. Lovingly maintained and cared for. MLS#8951493. TODD REALTY GROUP. Concrete building, floors and ceilings. Quiet and Private. MLS#8160428. Colo Real Estate Corp. The unit also comes with a covered reserved parking space and your own storage unit. MLS#8002438. Keller Williams Realty Downtown LLC. Located between Downtown Denver and Cherry Creek, Easy access to Public Bus Transportation, enjoy all the new restaurants and shops along Colfax, high school is East! Just move in! MLS#7271088. HomeSmart Realty Group. This unit has working fireplace, hardwood floors, original trim, dinning room has built-in hutch, conservatory and mudroom/laundry room. Furnished or unfurnished. MLS#9372865. LEONARD LEONARD & ASSOCIATES. HOA includes central heat and AC! MLS#8225626. MAKE Real Estate. This condo will not last long. Call your broker today. MLS#2075649. LIV Sotheby's International Realty. Enjoy the very walkable neighborhood of Cheesman Park, just steps to the park and blocks 2 shopping and dining! MLS#7765292. LIV Sotheby's International Realty. No one above or below you. A real gem. MLS#1511607. Camber Realty, LTD.
Just 2 blocks from Cheesman Park and a short walk to nearby shops, restaurants, and so many things to enjoy all year long! MLS#2947978. RE/MAX Cherry Creek. See special features flyer in additonal supplements for extensive details on home! MLS#7539824. Calibrate Real Estate LLC. Don't miss out on this rare opportunity! MLS#2278844. Keller Williams Integrity Real Estate LLC. A short drive to the Cherry Creek shopping, Whole Foods, Trader Joes, and Wash Park. MLS#4951570. eXp Realty, LLC. Great first time buyer or rental opportunity with rents starting around $1700! MLS#8021724. LoKation. Be at the heart of Denver, inspired by this charming treehouse condo. MLS#4049392. HomeSmart Cherry Creek. New built oversize 2 car garage, new HVAC, CENTRAL AIR, WATER HEATER, WITH WARRANTIES! MLS#3893352. Lux Homes Denver. 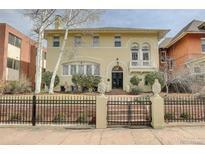 Steps From The Legendary Voodoo Donuts, Blocks To Cheesman Park + Easy Walk To Many Restaurants and Hot Spots. Must See, Won’t Last! MLS#8857242. Keller Williams Realty Downtown LLC. Sizable space for 2 and a pet, single professional or investment rental property (other 2 bed units in complex earning over $1600/month). MLS#3440683. Compass - Denver. Shared courtyard with quiet neighbors. MOVE IN READY! HURRY! MLS#3193396. Greenspot Real Estate. Comes with a storage unit and in-unit washer & dryer is included. Quiet and secure building. MLS#9184441. 360dwellings Real Estate. Rental parking offered across the street pending availability. MLS#2984026. KENTWOOD REAL ESTATE DTC, LLC. A block from the park and minutes from downtown Denver/Cherry Creek/Capitol Hill and Uptown! MLS#9334253. eXp Realty, LLC. This corner unit boasts an open layout that makes it feel airy and large with updated espresso kitchen cabinets, granite countertops, kitchen island, space for a dining nook, newer windows, a storage unit, and an updated bathroom. MLS#2279596. West and Main Homes Inc.
Building is very pet friendly, and is an FHA approved complex. Hurry on this one! MLS#1576626. Realty One Group Five Star. 2 Blocks from Denver Botanic Gardents. Location, Location, Location! MLS#5704993. Porchlight Real Estate Group.